Can women ever escape the terror of ageing? While its highly unlikely that you can stop ageing, we can start by slowing down the process and building a defence system against it - with the right connotations. 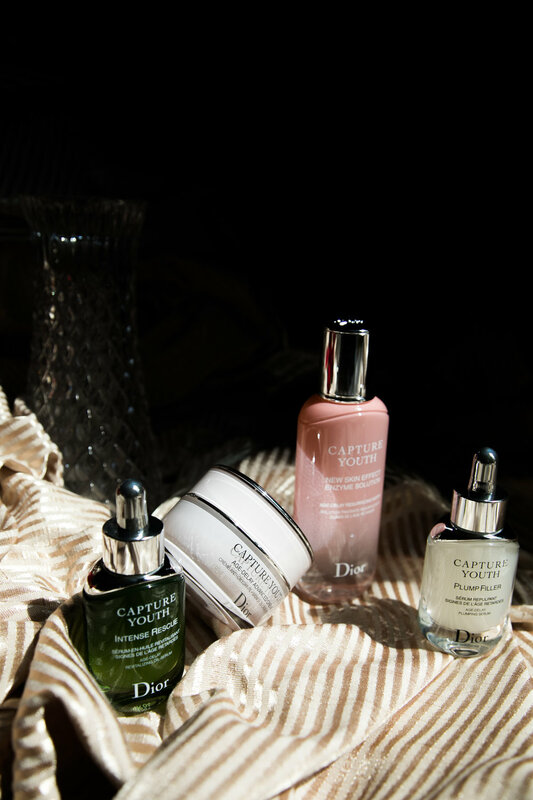 Unlike most products that provide anti-ageing properties and benefits to prevent ageing, the Dior's Capture Youth range contains rich antioxidants that protect our skin from premature ageing. With this in mind, the Dior Capture Youth collection contains different formulated serums to address different skin types and concerns. As a nightly routine, I would start by patting on the New Skin Effect Enzyme Solution that rehydrates my skin after a long day at work. Infused with exfoliating Papaya enzymes and Iris Florentina, the lotion helps to eliminate dead skin cells, leaving a soft silky touch. Next up, serum. As my skin can be pretty dry on stressful days, I would mix the Capture Youth-Intense Rescue Age-Delay Oil Serum with Age-Delay Advanced Creme to combat my dull skin. The newly launched lipids-replenishing oil serum includes fatty acids from Tamanu and Argan Oil that intensively revitalised and repair skin from beneath. Ideally, for those with dehydrated skin, I would suggest applying it separately instead. To strength the skin barrier, I finish my the skincare routine with the Plump Filler Serum to lock in moisture for the night. Scrolls below for the full routine! It’s as simple as it gets. This enzyme solution is pretty cool. It helps eliminate dead skin cells and diminishes surface imperfections. Personally, I like using this as a base before my facial toner as it helps the faster absorption of essence. You can also use it with soaked cotton pads under dry areas of your face! Step Two: Pat It IN! However you want! Just no rubbing and pulling of your face, please. Massage it in using light strokes from chin to ears. I like to do a Gua Sha facial massage with all my night creams as it firms up saggy muscles, improves dark circles and bags. Steps over here. From Asia, With Love. Chanel Beauty Spring/Summer 19 is here. The New Burberry B Series Launches On 17 January 2019!